So the new issue is out - hot off the press and our D'arcy Spice pattern is there! D'arcy Spice is an autumnal English apple variety which we thought suited the shades in the wool. 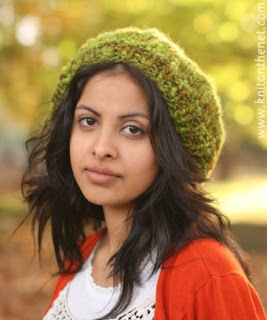 These green/olive shades are always very popular and the chunky yarn is great to knit and quick too. You can order online through our site http://www.lazykate.net/ and let us know what you think - now that it's easy to leave comments it would be great to hear from you. Also, and this is a cautious excitment, we think our barge may be ready by the end of the week, we went to visit the other day and there is painting!! There is wood pannelling and even room dividers. So we have the champagne on ice ready for Friday, Monday or Tuesday, whichever the launch day may be. Keep your fingers crossed! "Next row: Increase 22 sts evenly across next row. Starting with a purl row, work in stocking stitch for nine rows." I don't get it. Do I just suddenly start increasing 22 sts on the next row or do I divide the 48 sts and increase in between to a total of 22 sts and end up with 70 total? I'm so lost! Forgive me, I'm still newbie when it comes to knitting berets.